Zach Lefebvre is a multi-instrumentalist (cello, piano, guitar, tin whistle) and song and tune composer playing with various musical groups including The O’Schraves and Wildwood Soul. 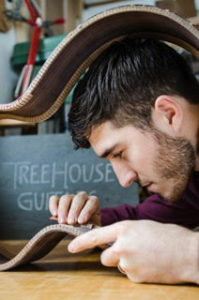 Zach is also a rising star in the world of guitar-making, crafting world-class guitars for discerning musicians worldwide (www.treehouseguitars.com). Zach approaches music from a creative and improvisational perspective – this is where he believes we can find much joy and magic in music. His classes are often centered around exploring and encouraging musical creativity.